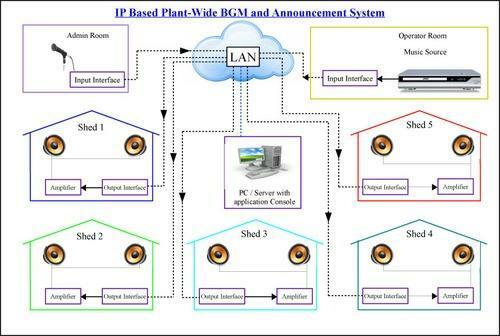 - The Plant-wide BGM and Announcement System is an IP based Public Address System. - This PA System consists of a microphone through which announcements are made. The mic is connected to an Input Interface Unit (IIU) and terminated in the LAN Network. * The Plant-wide BGM and Announcement System is an IP based Public Address System. * This PA System consists of a microphone through which announcements are made. The mic is connected to an Input Interface Unit (IIU) and terminated in the LAN Network. * The Output Interface Unit (OIU) is connected to the LAN network wherever loudspeaker are to be located are required. The audio output from the OIU is fed to an amplifier and loudspeakers are connected to the amplifer output terminals. * OIUs can be connected to the LAN at number of points where loudspeakes are to be fixed. The audio output from each OIU should be fed to an amplifier with loudspeakers. * PC / Server with application Console and software are supplied for operation of the PA system through LAN Network. * IIUs can be provided at other points in the LAN networks where mics or music sources are located for broadcast. * The PA System through LAN can be provided to the industries at less captial investment in view of availability of LAN network. * Background music, general announcements and emergency announcements can be made through the LAN PA system. * The area of usage is spread out widely and can be employed in workshops, schools, offices etc.